Embedding Google’s +1 button is pretty easy and straightforward. All it takes is to include 2 code snippets in your web page. One goes in the header of the page, and the other one goes to wherever where you want the +1 button to render. To do so all you need is to follow the official Google guideline outlined here. With that in mind, let’s build us Magento extension, preferably the non-obtrusive one. 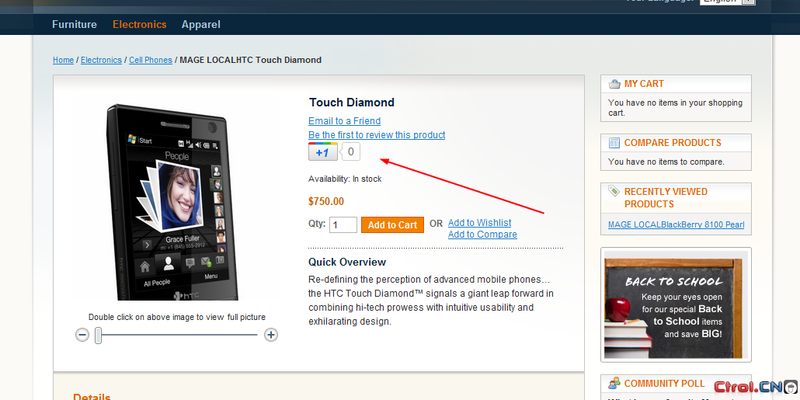 Carefully observing the gplusone.xml layout update shows that my layout is to “kick in” only on the product view page. Since embedding the Google +1 Button reguires two scripts to be loaded on page, I’m splitting them into two view files, app/design/frontend/default/default/template/inchoo/gplusone_head.phtml and app/design/frontend/default/default/template/inchoo/gplusone_button.phtml. If you look at the gplusone_button.phtml file you will see it has a call towards getSize() method from Inchoo_GPlusOne_Block_PlusButton class. At the moment, this method does nothing. It’s merely here for possible extension of this simple module. Given that Google +1 button supports various sizes (“small”, “medium”, “tall”, or no size definition for standard size) you can easily add some extra logic to this extension to have it read some config values that could be set from Magento admin. The point of this article was not to give you a full blown extension ready to be used in instance, rather to show you the amount of effort needed to implement something as simple as Google +1 button in Magento the right way (not to say that this is the best possible way). And here is the screenshot of the final result.